English amateur Matthew Fitzpatrick experienced the less flexible side of Augusta when his caddie was excluded for wanting to wear sandals. Regular bagman Lorne Duncan cannot wear shoes because of a foot condition but Masters rules dictate no sandals and Fitzpatrick, 19, was forced to find a new caddie for the week. Duncan vented his frustration on Twitter, saying: "Apparently aesthetics are more important than people. I told TD [tournament director] he was pathetic. I hate the place." 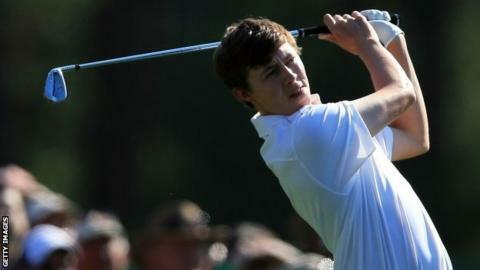 Fitzpatrick, who qualified as the US amateur champion, was keen to play down the incident on his Masters debut. "It doesn't bother me," said Fitzpatrick. "I'm very happy to be here and look forward to the week with an experienced caddie on the bag." Duncan's place will be taken by Northern Irishman Ricky Elliott, who caddies for American Brooks Koepka. Fred Ridley, chairman of the Masters competition committee, told the Press Association: "Duncan was told he had to wear tennis shoes like all caddies. We are not treating him any different. "I am sure whatever reasons he raised were considered." Duncan, who caddied for Fitzpatrick when he finished as leading amateur at the Open last summer, wrote a blog on Sunday explaining how the ban came about. "I went to speak to the powers that be at Augusta National about alternative footwear that would allow me to get through the week but my inquiries were met with a resounding "No"," he wrote. "My feet were so sore after one practice round in runners that I had no alternative but to withdraw my services. "I wish Matt all the success in the world this week and I will be watching with great anticipation from a safe distance with my feet propped up on some bar stool."